61. Someone told me a gas can can catch fire if it's filled while sitting in my car or the bed of a pickup truck. Is that really true? YES! - The danger is related to the buildup of static electricity from the flowing gasoline and the likelihood of a spark. Below are some tips from the National Institute for Occupational Safety and Health (NIOSH) Avoid the hazardous practice of leaving the portable gasoline containers in pickup trucks or cars when refueling! Before filling, always remove the containers from the vehicle and place them on the ground at a safe distance from the vehicle (provides path to dissipate static charge to ground). Touch the container with the gas dispenser nozzle before removing the container lid (provides another path to dissipate static charge to ground). Keep the nozzle in contact with the container inlet when filling (to dissipate static charge buildup from flow of gasoline). Turn off your cell phone while refueling. 60. Now that it's October can I safely move two large Boxwoods from a narrow planting bed next to my house? Evergreens in the midwest and northeastern US have "hardened-off" new growth by now, so the time for transplanting them is here. Due to all the details in answering this question, a separate page on transplanting shrubs is located here. 59. I always thought Springtime was the best for lawn seeding and improvement, but someone told me Fall is the best time. Which is it? 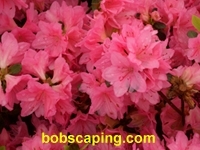 Spring and Fall are both good, but Fall is the best (see Bob's blog: September is Lawn Month). This is true in regards to seeding since 1) there is less weed competition in fall plantings, and 2) the young grass has two cool growing seasons before facing the heat of summer. It also applies to broadleaf weed control since weeds are starting to store reserves for winter and herbicides tend to be more effective. However, do not attempt to seed and control weeds at the same time -- in most cases the herbicide will adversely affect the young grass. With Springtime plantings it is best not to apply crabgrass controls and seed a lawn -- most pre-emergent chemicals also inhibit grass seed germination. Be sure to read the entire label of any herbicide you use! 58. What kind of Christmas tree doesn't drop its needles? 57. Some really weird stuff suddenly appeared on top of my wood mulch, what is it? "Dog Vomit Fungus" appears on wood mulch during wet weather during spring or summer. Due to its strange color (yellow, orange, tan, or white) and slimy consistency, people often suspect a dog threw-up in their mulched bed, hence the nickname. A second nickname is "Scrambled Egg Fungus." Technically speaking, it is a harmless slime mold fungus: Fuligo septicai. To improve the aesthetics of your mulched beds when it appears, scoop it up with a shovel and dispose of it. "Dog vomit fungus" alarms people when they first see it. 56. What kind of tree is this in my yard? The photo shows a white Dogwood tree (Cornus florida) in full bloom. It's possible that your tree could be an improved variety of Dogwood which is known for larger blossoms than standard Dogwood trees. The Kousa Dogwood (Cornus kousa) also blooms white but the blossom pedals are more pointed and the tree blooms later in the spring, often times in June. 55. Is it alright to do some lawn seeding in early April since the weather is still cold? When does crabgrass germinate? Grass seed is more resistant to cold than most people realize. In fact, some old-timers used to apply grass seed in the winter to allow the freeze-thaw cycle to work it into the soil. A more important concern when seeding in the spring is working around the herbicides applied for crabgrass prevention, since many of those can also inhibit grass seed germination (Crabgrass germinates when soil is 40-degrees F. or about the same time Forsythia drops its yellow blossoms). Sometimes it is best to postpone lawn seeding until "Lawn Month" which is September in the northeastern United States. 54. Should I worry about my daffodils with more cold weather coming? Gardeners are often concerned when daffodils poke their heads up before the weather seems warm enough. Not to worry, daffodils are a hardy bunch (pun intended) and the worst that can happen is some burnt leaf tips from a cold snap, which will have no detrimental effect on their blooms. Want to have some fun this year? Try mixing some red (or blue or green) food coloring in with the water in the vase for your cut daffodils and watch what happens over the next week! 53. What are the first Spring yard projects to focus on? Lawns will benefit from a light leaf raking to remove any remaining fall leaves which may have matted down. Lawn areas showing signs of snow mold (matted down grass) should be raked more vigorously to loosen and open-up the flattened-out grass. Ornamental grasses (like Maiden Grass) and perennials that were not cutback in the Fall should be cutback early in the growing season. This is also a good time to sharpen your lawnmower blade and ensure your lawnmower starts after sitting all winter. If fuel stabilizer was not added to the gasoline in the fall, your fuel system may be clogged and require service. 52. Something chewed the bark off my Burning Bush last winter and the shrub was weak this year. How can I protect against more damage this winter? This type of damage often occurs on Burning Bush (Euonymus alata) during the winter months. Rabbits are most often to blame, but this type of damage can also be caused by rodents. Your best protection is a physical barrier of some sort, and a hoop of wire mesh is often the easiest and most effective, even though various trunk wraps will also work. Be sure the mesh has small enough holes to resist all the various types of rodents you may be dealing with. One important thing to keep in mind: Rabbits are "elevated" when snow accumulates on the ground, raising them up to new heights for their bark-gnawing activity, so be sure to protect your Burning Bush trunk and branches higher than you might be initially planning. Most Burning Bush will recover from some bark damage provided it isn't too extensive, and doesn't go all the way around the trunk. 51. The tall grasses in my shrub beds are turning brown, should they be left like that? The tall grasses you speak of are called "ornamental grasses." These grasses have become quite popular over the past decade, and include numerous varieties of varying heights. Probably the most common variety we see is Maiden Grass (pictured) which tops out around 6-feet, with the plumes extending another foot or two above that. Whatever the variety, they should be cut low (12-inches for taller varieties) between the time they go dormant (turn brown) and when they begin to green-up in spring. Even though they need this cutback procedure, you still need to leave enough height on the old stems for them to re-sprout the following year. While many people enjoy seeing the brown foliage and plumes over the winter months, what they don't enjoy seeing are the plant parts breaking off and blowing around the yard over winter, adding to winter messiness and spring clean-up. Therefore, for gardeners in the northeastern US, the best time to cut back ornamental grasses is between Thanksgiving and Christmas. We use commercial grade gas-powered hedge trimmers to make quick work of cutting back even the large clumps. It often helps to double-team the project if you are cutting more than a few, one person running the trimmers and the other standing by with a leaf rake to pull away the cut stems and see what remains to be cut. Others like to "bundle" the grasses, with a strap or twine, to keep them together for easier removal. 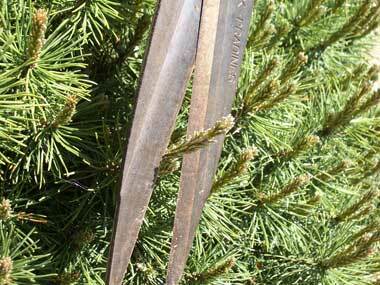 When you are just cutting a few smaller clumps, a sharp pair of hand shears like the ones in the photo will work fine. Ornamental grass sheared back right before or right after winter. 50. Is it a good idea to knock heavy snow off my shrubs? Heavy snow loads can damage trees and shrubs, especially those with brittle branches. In one case, I've seen European White Birch trees get bent over to where their tops were touching the ground, and then recover to an upright position the following growing season while showing very little damage. On the other hand, it's not uncommon to see fast growing trees split apart by ice and heavy snows. The hardest part of removing snow accumulations from frozen plants is doing so without damaging the plants. So, removing snow from plants is often a judgment call. It is often best to remove some of the snow without overdoing things and risking damage. A regular kitchen broom seems to work as well as anything else we've found in the tool shed. When removing snow, remember that most branches bend more easily up and down than to either side. 49. I was told my lawn is getting a thick thatch layer that will soon become a problem, so what can I do? The first seven years with a new home lawn are usually problem-free, at least when it comes to thatch build-up. That's why it is sometimes referred to as "the honeymoon period." But if you have been following an aggressive fertilization program with 4 or more applications of nitrogen per year, you will soon start to build a thick thatch layer. Once thatch exceeds 1/2-inch thick on lawns in the Northeastern US, all sorts of problems will become more prevalent. Your best "preventative medicine" is core aeration: Once per year is standard, but we would recommend twice a year (spring + fall) on lawns with 1/2-inch or more of thatch. Leave the soil cores on the lawn surface to breakdown on their own. If your soil pH permits, apply a light application of lime following aeration. Overseed bare spots with a similar seed mix -- the seed landing in aeration holes will grow if the season and conditions are right. Bag your clippings. Cores from lawn aeration show how thick this thatch layer had become. Aereate at least once annually. 48. Is this (October 15th in Pennsylvania) a good time to plant Chrysanthemums? Mums are great choices for fall color since they will weather a few spells of cold weather and frost well. However, multiple frosts and freezes will begin to diminish the flowers. Also, if you are planting Chrysanthemums with the intention of having them survive the winter and bloom again next fall, it is best to plant them as early as possible (early September) so they have a chance to get rooted-in before winter weather arrives. When you do plant Mums, pay close attention to keeping them watered, since many Mums are grown in small pots with fast-draining potting mix and they dry-out quickly. Chrysanthemums need to be pinched early in their summer growth cycle to keep them bushy and compact, but pinching them too far into late summer will remove the flower buds. 47. We have some sort of light green lawn grass that grows faster than the rest, what is it? Actually, that "grass" you are seeing isn't a grass at all, it's a "sedge." Yellow Nutsedge is a common weed in lawns and often arrives with topsoil that has been excavated from bottom ground (near creeks and streams) since this sedge likes moist soil conditions. If you pull one of these plants out of the ground, and roll it between your fingers, you'll notice the base of the stem is triangular instead of being round. Its other common name "nutgrass" refers to the small nut-like bulbs that form on the tips of its root system, and the plant spreads by these nutlets and by seed. Yellow nutsedge can be controlled by hand weeding or by using a lawn herbicide specifically labeled for yellow nutsedge. It is best removed before it becomes well established, since it can be a persistent weed. Easy identification since the stem is triangular. 46. When should I trim my Pine trees? This is a tricky question, since most people intermingled the word "pine" with "evergreen." In other words, a lot of people mistakenly call Spruce trees "Pines." While Spruce trees (think Blue Spruce) can be trimmed almost any time of year, Pines should be trimmed at a specific stage of growth, in order to allow time for new buds to form on the growing tips. For Pine trees, the proper time to trim them is when the new growth (called a "candle") has fully elongated and the needles are just starting to lengthen. For those of you in the Northeastern United States this would be the month of June. Remove one-half to two-thirds of pine "candles" to help keep pines more compact and shapely. 45. If someone applies over-the-counter pesticides (that can be purchased in most garden departments) for someone do they need a Pennsylvania applicator's license? 44. My flowering Pear tree has a large swollen area at the base of the trunk. Is that normal? 43. Now that my daffodils are finished blooming, can I cut them down to the ground? It's important not to remove daffodil leaves since they help the bulb 'recharge' for next year. In Pennsylvania, it's safe to remove the foliage around the 4th of July. Fertilize daffodils with a balanced fertilizer (like 10-10-10) when they are finished blooming. 42. My neighbor told me to do something to my lawn when Forsythia is blooming. What is it? Crabgrass germinates in the spring at the same time blossoms are falling off of Forsythia (when the soil reaches 50-degrees Fahrenheit). Therefore, the bright yellow flowers should remind you it's last call for getting your crabgrass control applied to your lawn. This is what's technically known as a "plant phenological indicator." Another phenological indicator is the hatch of Gypsy Moth eggs when Serviceberry trees are in full bloom. 41. Mulch: Should I worry about getting termites in mulch from Lousiana? Since Hurricane Katrina, people have been concerned about Formosan termites arriving locally in mulch products. After all they say, Formosan termites don't need soil to survive, they only need wood and a source of water. On the other hand, most experts feel the Formosan termites can't survive outside the southern climes. Also remember that state agriculture officials in Louisiana and Mississippi have quarantines in place for all wood products from areas infested with Formosan termites, including all areas affected by Hurricanes Katrina and Rita. Still not sure? Most bulk mulch products used in southwestern Pennsylvania come from saw mills in the tri-state area (Pennsylvania, West Virginia and Ohio). It would be cost prohibitive to ship it much further and still sell it for a reasonable price. Besides, we have an excellent supply of mulch here in the tri-state area, so why ship it any further than you really have to? Bagged mulch is commonly shipped from outside the tri-state area, but most experts agree that handling and packaging of those mulch products would likely destroy any termites that might by-pass the quarantine and processing. 40. With the prolonged heat and drought this summer I'm confused about watering -- some people tell me to water every day and others say not to water at all. Which is correct? The frequency of watering during summer drought depends on the category of the plants: a) Annual flowers - Annuals planted in the ground should be watered every day or two; hanging baskets daily. b) Newly planted trees & shrubs - Most of these plants need a thorough watering once a week, however, some shrubs such as Spirea and Barberry will require watering twice a week. c) Established trees & shrubs - Even established plants will benefit from a thorough watering every 2 to 3 weeks. d) Established lawns - Irrigated lawns being kept in a growing state should be watered 2 to 3 times a week. Lawns that have been allowed to go dormant should still be watered every 2 to 3 weeks to keep the root system alive. Basic rules of watering: Early morning is the best time to water. Always water plants thoroughly -- apply water slowly enough, and for a long enough duration, that it has time to soak deep in the ground, applying the equivalent of one-inch of rain. Remember that organic mulch slows the penetration of water into the ground -- dig down in a spot or two to see how deep your water has penetrated the ground. Soaker hoses and drip irrigation systems work well for watering plants thoroughly. 39. My lawn has raised ridges running all over it as if something is tunneling under the sod. Any idea what it is and how to get rid of it? Sure sounds like a problem with moles tunneling through the soil looking for food. One mole can eat 40 pounds of worms and insects per year! These raised tunnels are called "runs" and even after being packed down the "active" runs will be reopened. The active runs are where to focus your attempts at "trapping" moles with one of these three traps: the harpoon, scissor-jaw, or choker loop (check labels for safety precautions). Some experts feel trapping is the only method for effectively reducing a mole population. "Home remedy" mole control includes everything from Juicy Fruit gum to half-buried Coke bottles to chemical grub controls. A few homeowners have reported fair results from having battery-operated ultrasonic emitters buried several places around their landscapes, but overall trapping remains your most effective option. 38. Our Magnolia tree has black-colored leaves and some of the branches are losing their leaves. What's wrong with it? This sounds exactly like an insect infestation of Magnolia Scale. 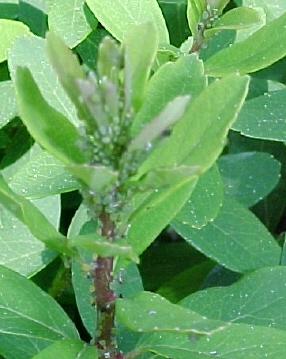 A black substance on the leaves indicates the presence of a sucking insect excreting honeydew. Black sooty mold grows on the honeydew giving the leaves a blackened appearance. Bees are attracted to these 'sticky' areas. 37. What steps need to be taken to prepare my lawn for winter? Several final steps will help your lawn in late Fall (November in Pennsylvania) -- Ensure your grass is cut short enough (but not scalped) to prevent it from "laying over" under deep snow cover. A 2 to 2-1/2 inch cutting height should be sufficient. It's actually best to gradually lower your cutting height over the final three cuts of the year, instead of trying to do it all in one final cut. Shorter grass is less likely to suffer from snow mold disease. Check for any last minute leaf accumulations that may smother your grass. If your lawn soil test calls for lime, late Fall is considered the best time of year to make a lime application. Retest your lawn soil every three to five years for deficiencies. Late Fall is the time to apply "winterizer" fertilizers -- these are usually high in potassium, which helps winter hardiness and disease prevention. Even though top growth of your lawn has ceased, the roots remain active to "pick up" the nutrients. If you're applying both lime and fertilizer, it's best to separate the applications by two weeks. After the final cut, service your lawnmower: Add fuel stabilizer to the gas tank and run the engine for 5 minutes to stabilize the fuel system (better yet... follow this step by draining the fuel tank and the carburetor). Perform all scheduled lawnmower maintenance such as oil change and lube, cleaning the air filter, replacing worn out or damaged parts and sharpening the blade(s). This is also a good time to install a new spark plug. 36. I planted a Hydrangea bush 3 years ago and it still hasn't bloomed! What's wrong? More than likely, your Hydrangea is getting trimmed at the wrong time of the year, whether it is by deer browsing or summer pruning. As with most flowering plants, only trim Hydrangeas within one month after they bloom -- that way you won't remove any flower buds. (This would be early fall in SW Pennsylvania). 35. Now that I've identified the insect that is damaging my shrubs, how do I know what insecticide to spray with? A great tool is available on the internet -- the NPIRS (National Pesticide Information Retrieval System). Extensive information is available for hundreds of pesticides. 34. A neighbor said there is a 'correct way' to shape my hedges when trimming them... what is it? The key to trimming hedges and other ornamental plants is to ensure sunlight can reach the lower branches. Many plants tend to grow wider at the top, reducing the amount of light reaching the lower branches and causing them to thin-out or become bare. To trim hedges the 'correct way' keep the bottom branches as long or longer than the top branches. 33. We installed some landscape lighting in the garden and have ongoing problems with the wires being cut by bed edging and digging activities. What can we do? When you install garden lighting we recommend four things: 1) Bury the wires at least 12-inches deep (check local building codes for requirements); 2) Put the wires in plastic conduit to protect them from sharp digging tools; 3) Draw a diagram of where wires are located and file it away for future reference; 4) Show contractors working on your property where these wires are located. IMPORTANT: For digging projects beyond the scope of planting a few flowers it is very important to know the exact location of utility lines on your property. Contact the PENNSYLVANIA 811 ONE CALL system (or similar service in your state) at least one week prior to any major digging! Each utility will come out and mark the location of their lines. This service is free to homeowners. 32. This spring we need to locate an existing sprinkler head on our front lawn to plan a new shrub bed. How can we find it with the irrigation system still turned off from winter? Sprinkler heads can be very difficult to locate, especially in the spring of the year. Grass has usually covered them over and their dark color makes them very difficult to see. The best thing to do if you have an irrigation system is make a sketch of your lawn areas and mark where the sprinkler heads are located. Then use a 100-foot measuring tape to mark down at least two distances of how far the head is from specific objects. For example, a sprinkler head in the middle of the front lawn might be 25 feet from the front wall of the house and 38 feet from the driveway. This sort of pre-planning will save you a lot of time some day! 31. Now that Spring is near, newspaper ads say Zoysia grass is the greatest thing going. The photos look beautiful! Why don't more people plant Zoysia? In the midst of all that great advertising is the key objection -- Zoysia completely loses its green color after a hard frost and doesn't green-up again until warm weather returns. In Pennsylvania, this translates into a pale, straw-colored eyesore 6 months out of the year! Most of our clients want to get rid of Zoysia... now! We've also seen problems develop between neighbors when the highly invasive grass crosses a property line... then both neighbors want to get rid of it! Zoysia stays brown for a large portion of the year in northern climates. 30. Deer eat my shrubs more in the winter. What can I do to protect them? As deer continue to overrun our residential landscapes, homeowners must be more concerned about protecting their ornamental plants, especially during winter when heavier browsing occurs. There are 3 ways to protect your plantings, and we feel proper plant choices and exclusion are the two that work the best in the long run. Here are your 3 choices: Exclusion - Through the use of fencing or mesh, keep the deer away from plants. Effective deer fencing needs to be 6 to 10 feet high, depending on the exact location. There are also some plastic meshes available to drape over top of plants. Some of the newer meshes and fences are difficult to see, adding to their desirability in the home landscape. Repellants - There are several commercial products and "home brews" that can be sprayed on plants to discourage deer browsing. The biggest disadvantage is sprays need to be reapplied on a regular basis, and even more frequently during wet weather. BEST OF ALL: Plant choices - Deer have "food favorites" just like us. Lists are usually broken down into categories of desirability. However, it's important to remember that deer will eat ANY PLANT during a severe winter when other browse is scarce. Highest browse risk: Most Arborvitae and Taxus (Yews). 29. Do my trees and shrubs need to be fertilized during the summer months? Fertilization of woody ornamentals should cease around mid-July so plants have time to harden-off new growth before winter. Late summer fertilization can lead to winter-kill. Fertilization of annual flowers and vegetable plants should continue throughout the growing season. When using liquid fertilizer (scoops of soluble fertilizer granules added to water) it is best applied to moist soil. If necessary, water your annual flowers first, then apply the liquid fertilizer solution. 28. The ornamental grass clump in our back yard still has alot of brown in it from last year. What should we do to get rid of it? Ornamental grasses should be cut back to low (6 to 12 inch tall) clumps in late fall or early winter, every year. Use twine or a rubber strap to wrap the dead bundles tightly together before cutting them -- this will ease cleanup work. If new growth has already mingled with the old brown stems, it may be best to wait until late this fall to cut them back. Ornamental grasses should also be divided, or split, every 3 to 4 years. 27. My pine shrubs (Mugos?) have branches that look like sticks? All the needles are cut to stubble... what gives? Sawfly caterpillars appear for 2 or 3 weeks in May and wreak havoc on Pines if you aren't alert to their arrival. They are difficult to see, so you should scan the pines for areas where the branches look thin, and the caterpillars will be close by. Handpick them or spray with an insecticide labeled for sawfly on pines. 26. The trees in my yard have silky tents in them? Spring brings Eastern Tent Caterpillars with it, and the smaller, lower tents can be 'rubbed out' using a gardening glove, or sprayed with a properly labeled insecticide. The biggest problem is getting the insecticide to penetrate the webs, however, spraying still helps since caterpillars will come out to feed on surrounding foliage. ALWAYS READ THE ENTIRE LABEL ON PESTICIDE CONTAINERS! Eastern Tent Caterpillars arrive quickly in the spring and are easily distinguished by their location in the "crotch" of a branch. In stark contrast, Fall Webworm tents are formed at the branch tips. 25. My White Pine trees have lots of inner needles that have just recently turned yellow. Are the trees dying? (September question from Pennsylvania homeowner) Pines commonly shed some of their older (inner) needles in late summer. With the wet summer of 2000, this natural occurrence seems to have been delayed one or two months. If you still have green branch tips all over the tree, the tree will be OK.
White Pines shed their older needles in late summer or early fall. 24. My son's shoes are orange after he has been out playing on our lawn! Does this have something to do with our late summer weather? Turfgrass is one of the plants affected by "rust disease" in late summer. 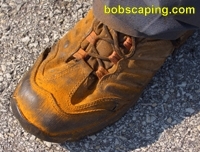 The fungus has rust-colored spores which easily rub off on clothing and shoes. Rust is considered a "low fertility disease" and an application of nitrogen lawn fertilizer in September should help suppress this disease. A fungicide application probably isn't warranted. 23. Some of the twigs on my trees look "notched" -- like someone slit them with a sharp knife. Some twigs have also died and broken off toward the branch tips. What's going on? These sound like the classic symptoms of periodical cicada damage ("17 year locusts" -- remember their loud buzzing in 1999? The notching occurs when the insect uses its 'ovipositor' to lay a row of eggs along a branch. Most trees usually recover from the damage quickly... pruning out damaged branch tips will help speed the process. 22. My hemlocks and azaleas look "bleached out" or bronze colored -- is this due to the summer heat and drought? Hemlocks are commonly damaged by cool-season spider mites, which can be controlled with labeled sprays in spring and/or fall. (NOTE: Most other mites on ornamental plants in Pennsylvania landscapes thrive in the hot/dry conditions of summer). Azaleas we see in clients' landscapes are becoming more commonly affected by lacebugs -- this pest can be controlled with labeled sprays in late-spring and/or late-July. We're also seeing lacebugs more frequently on Rhododendrons and Pieris Japonica. Lace bugs on underside of PJM Rhododendron leaf. 21. Trees bordering my backyard look like they have tent caterpillars. What can I do? The webs you're seeing on the branch tips appear in mid to late summer, and are actually caused by Fall Webworms. These caterpillars differ from the Eastern Tent Caterpillars you see in the spring, and really love 'Wild Cherry' trees! Webs can be pruned out and destroyed. It is difficult to reach and penetrate the webs with an insecticidal spray. Always READ THE LABEL on any pesticide you decide to use! Also, make pesticide applications in the cool part of the day when there is no wind (early mornings usually work well). 20. The tree I park my car under is dripping sap all over the outside. Why? Sap dripping from trees is usually due to an insect infestation like aphids (plant lice). The insects excrete excess "honeydew" which drips onto anything below. Honeydew will grow a sooty mold, making the tree branches look blackened. Also associated with aphids are ants, who have a symbiotic relationship with the aphids. The ants act like farmers, moving the aphids to the best feeding sites (near the growing tips) and in return harvest some of the excess honeydew for their colonies. Aphids clustered on branch tips. 19. Something has been digging in my mulched beds, and has even "turned over" some sections of my lawn. What is it? Sounds like a raccoon problem. Raccoons browse nocturnally for insects and other food in this manner. Skunks are also known for this type of activity, and have been known to destroy large areas of golf course fairways searching for grubs. Solutions include trapping the animals (call your township's "Animal Control" office) or treatment to reduce insect populations. 18. Why is there a big flock of Black Birds on my lawn this Spring? Chances are you have an infestation of Sod Webworms and the birds are having a group lunch . You will also notice small round holes in the sod where they have worked their beaks into the turf. You may want to treat your lawn with an insecticide, following label directions. 17. What can I do to improve my annual flowers this year? Good soil, nutrients and regular waterings are the 3 main ingredients for healthy flowers. Try mixing some mushroom manure in with your soil, or use it as a mulch. Mix some high-phosphorus fertilizer (phosphorus is the middle number "10" in: 5-10-5) into your flower bed and follow-up with liquid fertilizer such as Peters 20-20-20 or Bloom Booster. Keep flower beds watered --- especially new plantings. Morning is the best time to water flowers, evenings are alright -- but the earlier in the evening the better. 16. When can I plant my tomato seedlings outdoors? 15. Is there a good way to start flower and tomato seedlings indoors without buying expensive "grow" lights? An effective and economical way to give seedlings the artificial or supplemental light they need is by using standard fluorescent bulbs. Using a 2-tube fluorescent fixture; install a COOL WHITE tube (blue spectrum) in one side and a WARM WHITE tube (red spectrum) in the other side. Try to keep the fixture within a few inches of the plants -- this type of light won't burn the foliage. IMPORTANT: When starting plants from seedlings, be sure to use STERILE growing medium. There are many "soil less" mediums available -- usually consisting of a Peat/Perlite/Vermiculite. DON'T reuse old growing medium -- you can introduce plant pathogens, and seedlings are very susceptible to diseases. ALSO: Proper soil temperatures are important for good seed germination. A 65 to 70 degree F. room should be fine. But in a colder room, look into using a soil heating mat made specifically for use beneath "flats". 14. How can we minimize plant damage from "de-icers"? Gypsum [calcium sulfate] applied to soil surfaces bordering walks, driveways, and streets at a rate of 50 lbs. per 1,000 square feet (in Pennsylvania) will help minimize damage from Sodium Chloride. TIP: Gypsum is best applied in the fall, but spring applications will also help. The use of Calcium Chloride as a de-icer is a 'wee bit' more "plant friendly", but too much can also harm plants. (Keep in mind that Gypsum will not counteract the "salt effect" of Calcium Chloride). REMEMBER: Any de-icer that increases the number of "freeze-thaw" cycles can damage concrete. And that includes most of them. THE SAFEST: Messy, but. . . Sand (or small gravel) is good for traction on ice. TIP: Protect your stockpile from freezing. 1) Try to dig a hole for the tree in advance of planting time, on a day when the weather is decent. Cover your soil pile. Your hole should be no deeper than the root ball and about 12 inches wider on each side. 2) Don't keep the tree in the house any longer than necessary -- two weeks should be about the maximum. 3) Only water the tree once or twice while it is inside. Remember - the tree is dormant. 4) Locate the tree away from a heat source. 5) Lift the tree by the root ball when moving it. "Double team it" for safety and ease. 6) Water the tree thoroughly following outdoor planting. 7) Remove constricting ropes and synthetic wraps from the trunk area and root ball when planting. 8) Stake the tree (if it is at all "wobbly") for the first growing season. 9) Plant the tree where it will have adequate room to mature. 10) Water the tree once a week in dry weather during the first growing season. 11) Use a plant protectant spray to protect evergreen foliage. 12. What type of fresh-cut Christmas tree lasts the longest? Fir trees are still our favorite. Their extra cost is really worth it when it comes to their longevity, soft needles and that "fresh-peeled Orange" citrus aroma. Douglas Fir is quite popular, but we like the Fraser Fir, with its thick needles highlighted with silver undersides. Bob's tip: When you get your cut tree home, make a fresh cut at the base, and store the tree in a container of water in the garage until it is placed in its stand. 11. What can we do to keep our Christmas tree, wreaths and greens fresh longer? We recommend spraying them with an "anti-desiccant" such as "WILT PRUF" before you bring them inside (follow label directions). This milky-looking substance dries to a shiny clear coating that helps seal in moisture, keeping greens fresh longer. 10. Deer have been eating my vegetable plants and shrubs. What's a person to do? There are several temporary solutions such as human hairballs and commercial deer repellents, and we've had luck planting shrubs that aren't "preferred" deer food, but it will actually take good deer-fencing to keep deer away. Also see our Pests webpage with a section on deer. 9. A neighbor said it is best to water at night. Is that true? You may remember the old adage - "Believe none of what you hear and half of what you see." Well. . . it definitely applies here! Night and evening watering can help promote fungus disease. Why? Because it lengthens the "wet period" of foliage, creating an environment that fungi love! Instead, try to water early in the morning, if your schedule permits. If there is less than one-inch of rainfall per week, thoroughly water new trees and shrubs once a week during the growing season (spring and summer). Newly planted flowers, sod and grass seed will have to be watered more frequently; sometimes daily. 7. Should I only plant trees and shrubs in the springtime? While there are a few trees (Oaks and "fleshy rooted" trees) that should only be dug in the spring, most plants today are containerized or balled-and-burlapped (B+B) and can be planted anytime of the year (more on planting trees). 6. Should I paint the areas where I cut off tree branches? No! Extensive research has shown that trees have natural defenses in the "collar" area if branches are properly pruned. Be sure to leave the "swollen area" (collar) at the base of the branch. 5. When should I prune my Azaleas and flowering shrubs? The best "rule of thumb" is to prune them within 30 days after they finish blooming. This will allow them time to form new flower buds for next year. 4. The grass at the golf course is mowed very short and looks great. Should I cut my home lawn the same way? Golf courses use a variety of grass (bentgrass) that can withstand short mowing. Your home lawn needs to be cut at 2-1/2 to 3 inches. Remember: The longer the blade the deeper the roots. Also keep your mower blade sharp! 3. My new lawn looked great the first 7 years we lived in our new home. Now it is starting to look bad --- Why? The first seven years with a new lawn is called the "honeymoon period". After that, you'll start to see problems mostly related to thatch buildup. Then "the honeymoon is over!" Try to core-aerate your lawn once or twice a year from the time it is planted --- that's good "preventive maintenance." 2. If I use a mulching mower will it produce thatch? Thatch is most commonly produced by heavy fertilization with nitrogen, and some naturally occurring causes. Mulching clippings is usually a good idea; just be sure to mow more often and only when the grass is dry (more lawn mowing advice). 1. How can I protect my tender annual flowers from frost? If you plant sensitive flowers before Memorial Day in Pennsylvania, you may find you'll have to protect plants from frost. We find burlap works the best, but an old bed sheet or similar fabric will do just fine. Some people use newspaper or paper shopping bags if wind isn't a factor. Remember: Covering plants won't protect them against a freeze --- in which case they must be moved to area that will remain above 32 degrees.